If you've been reading my blog for a while, you know I have a soft spot (okay, a really soft spot) for my friends who are waiting to adopt. Maybe I'm a bit of a broken record when it comes to doing anything and everything I can to spread the word about them in the hopes that some good will come of it. But I intend to be a broken record and keep spreading the word until these dear friends of mine are finally able to adopt a sweet child of their own. And if you feel so inclined (and I sure hope you do), it would be really awesome if you'd share a link to this post on Facebook, Twitter, etc. to help spread the word. When it comes to adoption, every kind thought and gesture counts. So thanks in advance for your love and kindness! And now I give you... Richard and Emily! Emily: My favorite way to start the day would have to be going on a walk with Richard and Carly. Carly gets so excited to go out in the morning and the air is still crisp and all is quiet. I love those quiet moments! What are the most embarrassing pajamas you own? Richard: I don’t really own embarrassing pajamas. Other than my Hello Kitty pjs (kidding, kidding). Emily: I would have to say the pair of snowman pajamas that has a huge hole in the front! I can’t wear them out in public. Haha! What’s your favorite kind of cereal and why? Richard: Raisin Bran Crunch because it is relatively healthy but still tastes good. Emily: Cocoa Krispies! Yum! Can’t beat that chocolatey taste! They never last long in our house. I know you have a little dog named Carly. Why did you two decide to name her that? Carly’s name is kind of unique story. We actually got Carly from Richard’s sister, via Richard’s parents. Due to some unfortunate circumstances, Richard’s sister couldn’t take care of Carly and so Carly was taken care of by Richard’s parents for a brief period. Carly was originally named Carlos. Richard’s sister named her that, kind of as a joke. When Richard’s parents had Carly they had to take her to the vet. They felt so embarrassed telling the vet that a girl dog’s name was Carlos so they quickly changed it to Carly. And Carly is the perfect little name for her! So sweet, just like her! Richard: I am currently in physical therapy school. I am now a third year! Woo! I am working on a doctorate of physical therapy. I enjoy helping people get back on their feet after an injury and like working with a variety of patients who have different injuries. Keeps my days interesting. Emily: I teach kindergarteners all day long. They are the sweetest little kids and I’m blessed to know them. I’ve taught over 180 kids over the past four years (due to having two sessions each year). I love it! But I’m even more excited to be a stay at home mom. Our little future babes already have so many books! They don’t all fit onto the bookshelf we bought for the nursery! What would you do all day if you didn’t go to work? 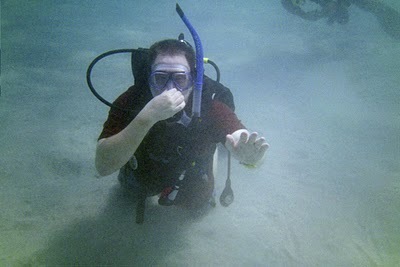 Richard: Scuba dive. Hang out with Emily and Carly. Go to Hawaii and scuba dive again. Emily: Play with Carly. And probably waste a lot of time. 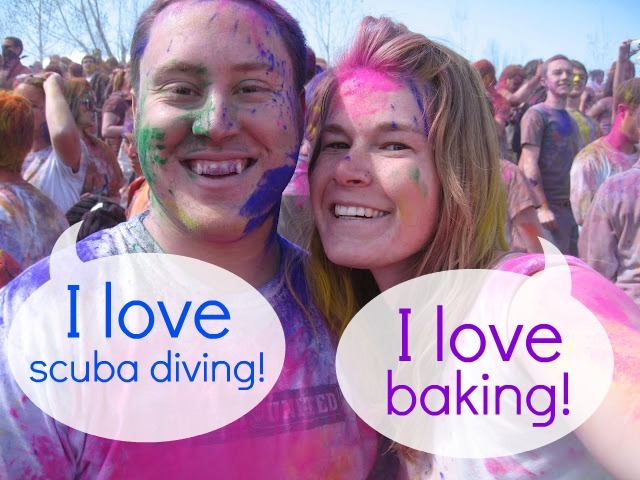 But also have lots of fun baking and crafting. And reading. If Richard was home too we would go bike riding or hiking and make homemade pizza together. Richard: I don’t really spend a lot of time on the Internet but I like going to www.sporcle.com when I’m bored at school. Emily: Any of my friend’s blogs! I especially love reading encouraging adoption stories. Oh and I love Pinterest. because I’m a Harry Potter nerd and proud of it. And this video is hilarious. 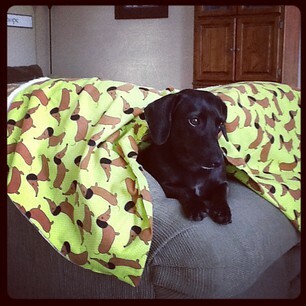 Emily: Currently it is this awesome commercial: http://www.youtube.com/watch?v=dWzH_D8SQwI Wooooh dachshund! What’s your favorite kind of pen (or writing utensil) to use? Emily: Markers! Sometimes, in high school, when I was sad my mom would leave a brand new package of markers on my bed to cheer me up. They’re so fun and colorful. And you can write people nice notes with them. Richard: Hawaii. For the same reasons as my awesome wife. Emily: Probably Hawaii. We went there on our honeymoon and loved it. It was beautiful! We saw rainbows every day, went whale watching, and had an incredible time. A very close second is the beach house my family goes to every year in the Outer Banks, North Carolina. What’s your go-to dinner meal when you don’t have anything planned and you’re already hungry? Richard: A Dominoes pizza that I can pick up on the way home. Emily: Cereal. Or pizza. We often make homemade pizza but if we were really hungry we would probably just go and get a $5 ready made pizza from Dominoes. What’s something you dream about doing someday? Richard: Living in a small cabin in the woods with my family. Not too far from town but far enough away that our kids can play and run and be outside. Emily: Owning a bakery! And going to Thailand! Celebrating our 50th wedding anniversary with my Richard! Which of the Ninja Turtles is your favorite? What are you currently into reading? Richard: The Hitchhiker's Guide to the Galaxy. And National Geographic magazines. Emily: Well, I’m currently rereading the Harry Potter series. I have only read the series once through so I thought it would be fun to read it again this summer. I also set a goal to read the Standard Works (the Bible, Book of Mormon, Doctrine and Covenants, Pearl of Great Price) in one year so I’m busy reading the scriptures often. What moment of finally being able to adopt are you most looking forward to? Richard: Just all the joys of raising a child. I can’t wait for Christmas morning, when our kid can run down the stairs and see what Santa has left for him or her. Emily: I can’t wait for the day when our baby’s wonderful birthmama places her baby into our arms. I just know tears will be streaming down my face. I can’t wait to see Richard holding our baby for the first time. I can’t wait to see our baby’s sweet little face and know that he or she will be ours forever. A lot of people want to help their friends who are trying to adopt, but they don’t always know how. What’s your favorite way that people have helped you while you’ve been trying to adopt? Passing out our pass along cards. We mailed out a lot of pass along cards to friends who asked for some but I’m not always sure they know what to do with them. We always appreciate hearing about how a friend has left our cards at a doctor office or with a restaurant bill or in a little giveaway bags, like Katie did. :) We hate to think of our pass along cards sitting on someone’s desk when they could be out circulating! You never know when someone might see one that you left somewhere and then contact us! Thanks so much Richard and Emily! It's been lovely having you here on the ol' blog today! Follow Richard and Emily on their adoption blog or visit their adoption profile on LDS Family Services for more information. If you'd like to get in touch with them, please contact them directly or shoot me an e-mail and I'd be happy to get you connected. And you can always find the link to their adoption blog by clicking on the Adoption tab on the side of my blog! Photo credits: All photos were used with permission from Emily & Richard's Adoption Blog. Their responses about Ninja Turtles made me laugh. I like how original your questions are, and like how funny Richard and Emily are. I hope you guys can adopt soon! Thanks Katie!!! We love you!